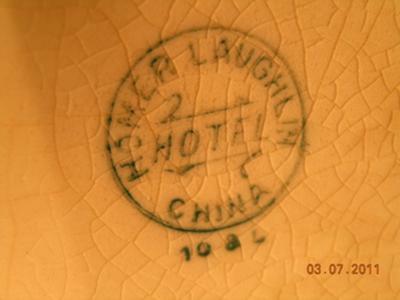 Famous Fiestaware Makers Homer Laughlin Circle Mark on Hotel Ware Pitcher:- This pottery backstamp is on an old homer laughlin hotel china pitcher or tankard (I don't know what it is, exactly). It was with my grandmother's stuff that was packed away in 1972, but most of the stuff was from the 30's and 40's. I am having a hard time reading the middle number to determine age. I have not seen this piece in any of the research I have been doing. I would like to find out what I can about this piece. Maybe you can help me, thanks. 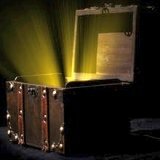 Remember to use the in-house search boxes. This circle mark for hotel wares is shown by my Kovel's Guide to be used from about 1901 - 1915, so the pitcher might be somewhat older than you think. ....But what a marvellous antique pitcher this is. Wonderful color and lovely utilitarian design - made for strength - and whatever the hard-wearing 'semi-vitreous' clay body (slip) Homer Laughlin used on these pieces was, it worked.... and contemporary with the Wright Brothers first flights. This pitcher is testament to the tradition of quality of American wares from East Liverpool Ohio. Pottery, Royal Doulton (c.1900) and Churchill (1990's). This is a hobby horse of mine, being involved in the ceramics industry most of my working life. 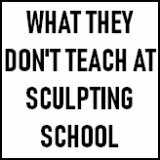 Ceramics companies that fail (and there have been a lot of them in the past few years), do so because they are run by people who don't put enough emphasis (and don't begin to understand) good design, how it works and how to stimulate it. It's as simple as that. The Homer Laughlin company of the 1930's obviously understood how important design was in the profit making process because they took on the services of English pottery designer Frederick Rhead (whose sister Charlotte was also a famous and highly collectible designer). Rhead came up with the Fiestaware line and the rest is history. First check out the pottery marks of any green items you have because if the mark shows it is the original green color production, this line is very rare and sought after by collectors - you may be in for a pay day. Secondly, watch out if you have a red/orange color because up to 1972, the glaze was colored with uranium and is tested to be radioactive. 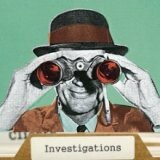 But don't get too uptight because in 1981 the U.S. Food and Drug Administration declared radioactivity levels to be so low as to not constitute a health risk, but in 1994, test showed leakages of gas to be 7 times higher than is safe. 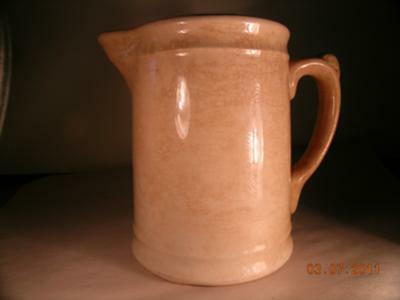 You have a "Hall Boy" jug, produced by Homer Laughlin in the early 1900s. Today, a similar item would be referred to as a Room Service pitcher. This jug was produced in our East Liverpool, Ohio plant which closed in 1929. This piece was produced in the teens. I am curious if any of you antique collectors and dealers out there might have an idea of the value today for this Hall boy jug from the 20th century teens. Any comments from you experts out there? I would appreciate any info. Thanks. Kelley, I saw you have Montana behind your name. I am also from Montana and today I found an old tin bucket in our pasture, I dug it out and found a couple smalls bowl, mostly broken but one was a full piece. They also have the same stamp as your piece and look similar. There was also a broken piece possibly and teapot or cup with a green floral pattern. Not that this helps you with your piece but I thought us both being from Montana with similar pieces was a story worth sharing. Nice Site! I looked up, but could not find anything on the markings I saw yesterday in a little county shop we stopped at. On a small set dishes of white with red transfer kinda like Currier & Ives blue willow pattern but it had the markings G48NE - Homer Laughlin. Another item I liked was a chamber pot white/ gold trim with rose pattern. It looks like the rose pattern may be transfer ware. Marking was W.T.K. Co.
Can you help me find out a little more about these markings. I like both items and would like to go back and purchase them, but the owner does not no what the marking are. So glad you are enjoying the site. You can learn to search more efficiently by going to my China Replacement page. These two items seem like nice little buys. The Homer Laughlin set does sound similar to their Currier & Ives range. Probably should retail for about the same. 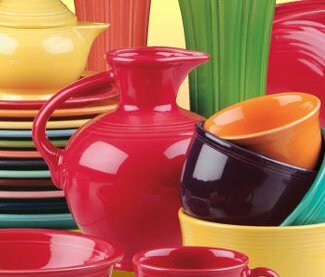 Remember, H L is a mass producer, so even though their Fiesta ware is collected, the prices are not at the top end and should represent great value for money. The chamber pot maker is a mystery to the shop owner and also a mystery to me. W.T.K. Co. is one of the few marks that I can find no record of at all anywhere. My best guess is it is a regional US maker, of which there are many hundred who would not be included in the standard reference books. There are 3 different English makers going under the pottery mark of W.T. & Co - but no potters mark W.T.K. & Co.
Hope that helps in making your choices. Went back to get some pictures, but it was to dark in the warehouse I guess because the pictures did not come out at all. Anyway I called the Laughlin Company in Newell VA., and found out the what G48NE - means. G is the month 48 Year and NE the plant. The pattern was used for railroad diner cars. They did not know the pattern name. Chamber Pot was gone so I could not get another look. The shop owners would not sell me just a cup/plate to add to my collection. But it was fun learning about the marks. Thank You Peter. You did great research there and thanks for sharing. Shame you couldn't just buy the pieces you wanted, or take some photos for us to see. Look forward to hearing about your next adventure! (and everyone elses). I found your comment because I was researching my own chamber pot, which has a similar marking. I too mistook it for W.T.& K. I found a website with a fancier pot, and the same marking. It turns out, it's actually K.T.& K. The website said it stood for Knowles, Taylor and Knowles Co. of Liverpool, Ohio, and it was dated around 1870. I hope this is helpful.